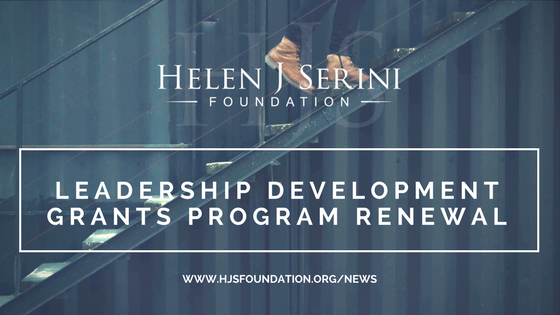 The Helen J. Serini Foundation is committed to investing in the leadership of our community's non-profits to ensure success today and into the future. In that spirit, we piloted our Leadership Development Grants program in 2017. After a year of funding, and much excitement and feedback from nonprofits in our community, we're excited to announce that this program will continue in 2019 and, hopefully, into the years to come. This small grants program will provide leadership and/or professional development for key staff and volunteers within our community's nonprofit organizations. Leadership development can mean different things to different people, so organizations applying for Leadership Development Grants are encouraged to outline the development they feel will be most impactful for their organization. This could take the shape of more "traditional" leadership development projects, such as attendance at a conference, seminar, or webinar. But we hope that organizations and individuals will consider other, more customizable forms of development and trainings as well--including mentoring, one-on-one coaching, membership in professional associations, participation in leadership cohorts or fellowships, or even sabbaticals. "Next Gen," mid-level, and young professionals are strongly encouraged to apply in addition to those in executive and manager-level roles. Budget for this program will allocated on a first-come, first-served basis. Funding requests will be capped at $1,500 per applicant, with a maximum of two applications per organization. Depending on the total size of your organization, organizations may be asked to contribute some part of the total cost of the professional development budget requests. Due to generous co-funding from the Ausherman Family Foundation, additional funds are available once again in 2019 for Frederick County nonprofits seeking professional development opportunities. For more information and details on how to apply for a Leadership Development Grant, click here.